The new mobile version of ExitToLive 1.1 is available. 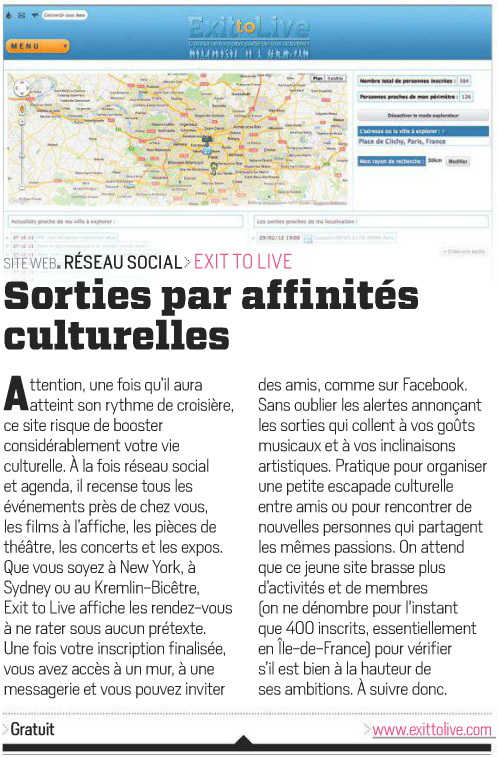 ExitToLive is a social network dedicated to events and outings. Leaning on his GPS system, it calculates and provides instant events and family outings from any location. Different types of events are sorted chronologically and classified under seven distinct forms: movie, theater, music, dance, sport, and culture. Whatever the tastes of the users, each event has a fact sheet concerning: displays the date, location and more information. ExitToLive itself as a key partner information and event management. ExitToLive full of ideas and suggestions for outings. The outings are arranged by topic and sorted by geographical distance. The application proposes to create its own outputs, or better yet, participate in outings offered by other organizers or professionals. In addition, the service provides a calendar of upcoming releases and greatly simplifies the task of inviting friends just a few clicks. Outputs are available in three disparate forms: public, semi-public or private. The outputs are visible to all public and everyone can participate, semi-public outputs are visible to all, but only the organizer of the output can accept and validate participants, and finally outputs are invisible private and only the organizer of the output can invite participants (friends)! Many combinations are possible, eg output semi-public, inviting friends and family open to people under approval of the organizer to get to know new people. Consultation events and outputs based on the geographical location of the user, thus, they are calculated and presented to the user and can be set by the search radius. On the other hand, has a ExitToLive exploration tool called the « Explorer Mode ». It evaluates and suggests events and outings the desired location around the world. It proves handy when you are moving or traveling. The application allows you to search for members, events, outings, and finally the points of interest close by the search radius established. This application provides I.G.D (Interactive Geolocated Directory) which allows members to access ExitToLive close points of interest as address and geographical location. The I.G.D enables amateurs and professionals to reference their establishments or places of business to promote their upcoming events, activities and outings. 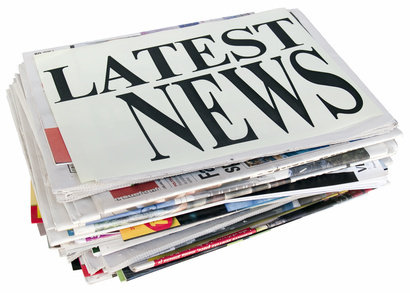 The mobile application is available in several platforms: Android, iPhone / iPad, BlackBerry and Windows Phone 8. This entry was posted in Mobile applications and tagged journalist, outing, press on 16/03/2013 by kSaMi. 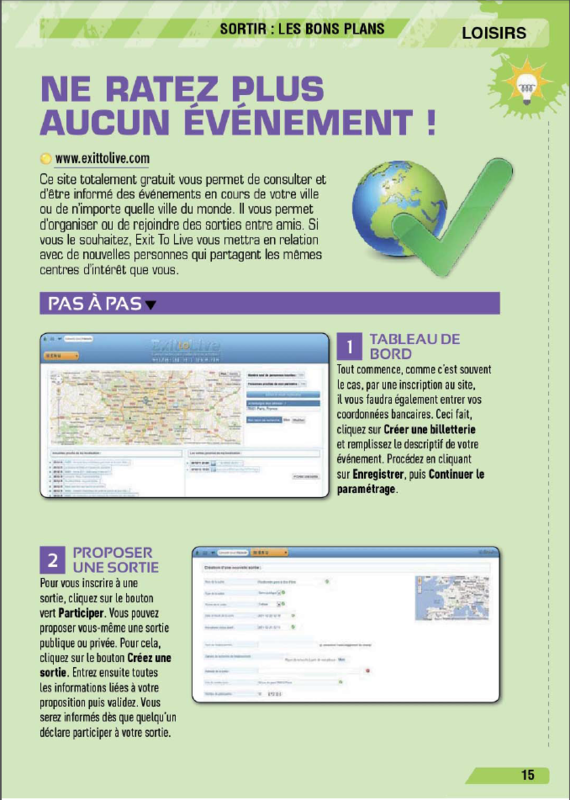 Find the latest press release of ExitToLive dated June 4, 2012 on Relations publiques in French. 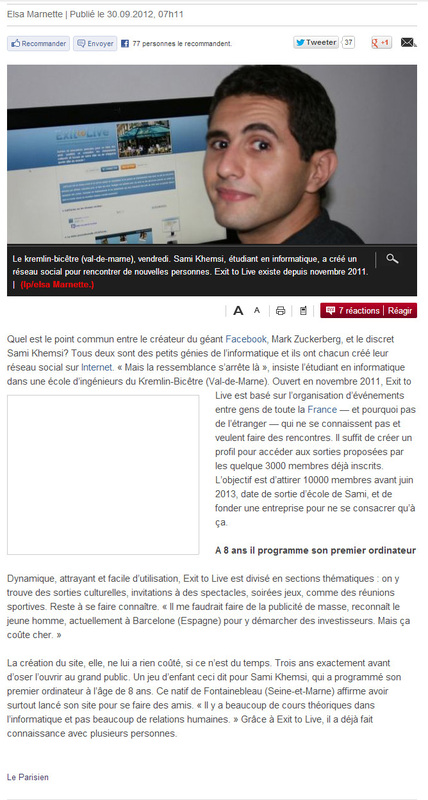 This entry was posted in Press and tagged journalist, press, press release on 13/09/2012 by kSaMi.